The Mind of a Helmet Camera Cyclist: The Biggest Threat to Recreational Cycling? The majority of my cycling is my commute to and from work, about 23-25 miles a day. However, when I get the chance, which isn't often (3 young kids!) I also hit the tarmac (no-not like that!) for fun.Where I live in Torrance, I am surrounded by some amazing countryside and some very interesting cycling. So today, using up some annual leave that I would loose otherwise, I took the day off, with the intention of getting a few miles in. This is particularly important to me as I am supposed to be taking part in Sportive Kinross in a few weeks time.....the BLACK route! Eek! To keep my route interesting I headed over my old enemy, Crow Road (the one over the Campsies not the one in Anniesland!). I have some prior with this one. 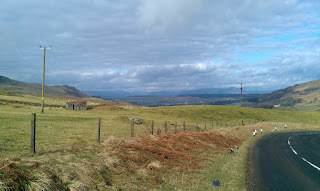 It was during todays ride, which was bloomin' hard due to a very nasty head wind (good for my legs I suppose! ), that I came across what I think is the greatest threat to recreational cycling in the UK. 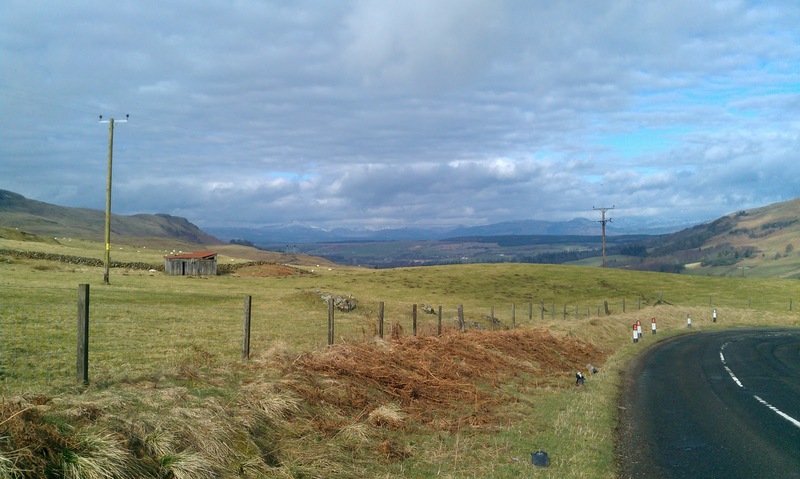 The potholes/ruts/crevasses in this picture (just outside Fintry) were entirely typical of the road surface on long stretches of road. It was absolutely no fun, whatsoever cycling on roads like this. It really was so bad in places that you risk damaging your road bike, by riding it on the road. It would be better to cycle across the fields. I've been cycling recreationally for a few years now, and I love it. I am hooked. There is nothing better than buzzing along a smooth road on a sportive, in a pack, or cruising along a deserted road with only the sound of the birds and flowing water. It really is special. However, had I just started this year, and this had been my first ride, I might well have just packed it all in then and there. The state of the roads is very depressing. I'm not sure if I can take that route again. My severely vibrated hands couldn't take it! So councils, I understand that the main roads are a priority, but if you value recreation at all, if you value the benefits of cycling on health and well being of the population and if you want to avoid getting sued to the hilt by a badly injured cyclist/motorbike rider, then sort these roads out. Totally agree on the roads. When I take the bike to work I have the suspension open instead of closed which I should be able to do happily on the roads. One road to work's had a drain uncovered for weeks. I know to expect and avoid it but anyone hitting it is coming off their bike. Roads are a disgrace.